Who doesn't know "How do I love thee, let me count the ways"... 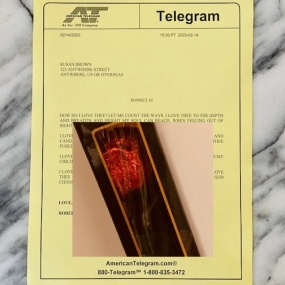 It's a beautiful Telegram we send with your signature. By the way, each item you order comes with a free 10 word Telegram. For the amount of words, this Telegram is highly discounted. Candygram® - Same Day Candy Delivery Service and Next Day Candy Delivery Service. Send Chocolate delivery Candygrams®, send Cake delivery pastries, send Stuffed Animals delivery items, send gift baskets delivery goodies, send Teddy Bears delivery orders, send Snack Baskets delivery gifts, send Corporate Gift Baskets delivery orders, send Fruit Basket delivery Candygrams®, send Cookie Delivery bakery items. By sending Candy Wire Services you can send cookies, wire gift baskets, send candy, buy chocolates and send chocolate candies 24/7 by sending Candygram® as your favorite online candy service, internet candy delivery and web candy company right now!